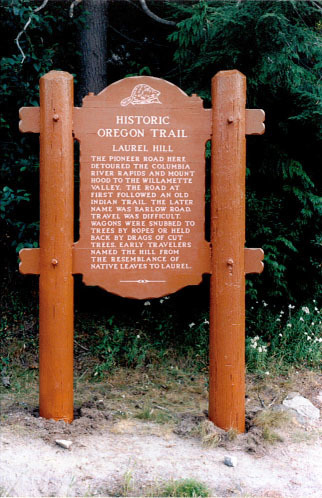 Subject:Site of the most treacherous descent of the Oregon Trail through Cascade Mountains. 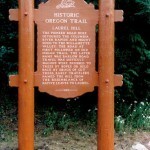 The Pioneer Road here detoured the Columbia River Rapids and Mount Hood to the Willamette Valley. The road at first followed an old Indian trail. The later name was Barlow Road. Travel was difficult. Wagons were snubbed to trees by ropes or held back by drags of cut trees. Early travelers named the hill from the resemblance of native leaves to laurel. On Highway 26 between mile posts 50 and 51—access for eastbound traffic only. A well-marked and very short US Forest Service hiking trail guides visitors to the Laurel Hill chute, where emigrants used ropes to lower their wagons down the steep slopes.